The control surface with two large touch panel displays and 38 faders enables you to perform general operations on the RIVAGE PM10 system. The control surface with single large touch panel display and 26 faders enables you to perform general operations on the RIVAGE PM10 system. The DSP-R10 is a powerful DSP engine that serves as the core for signal processing and system control required for the RIVAGE PM10 system. 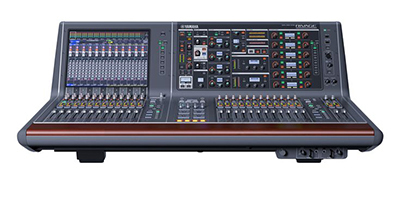 Superior capability of processing digital audio signals of up to 144 input, 72 MIX, 36 MATRIX, and two STEREO channels. Four HY card slots that are capable of transmitting/receiving up to 256 ins/outs of digital audio signals/control signals. Two Mini-YGDAI slots to support various audio formats. Dual redundant power supply built-in. 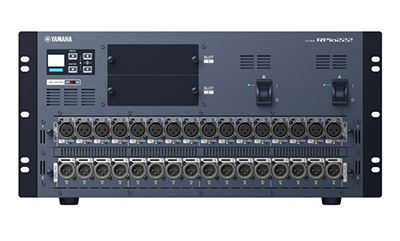 The RPio622 is an audio interface that enables you to flexibly configure and expand I/Os for the RIVAGE PM10 system as required by your application or the scale of your system. Six RY card slots that enable you to expand analog inputs and outputs, and/or digital inputs and outputs. Two HY card slots that are capable of transmitting/receiving up to 256 ins/outs of digital audio signals/control signals. HY card slot 1 features 256 ins/outs, and HY card slot 2 features 128 ins/outs. 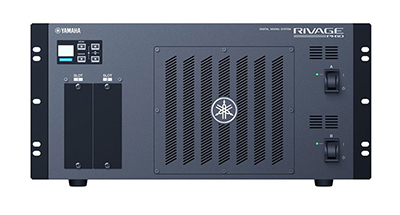 The RPio222 is an audio interface that enables you to flexibly configure and expand I/Os for the RIVAGE PM10 system as required by your application or the scale of your system. Two RY card slots that enable you to expand analog inputs and outputs, and/or digital inputs and outputs. The RY16-ML-SILK is a 16-channel mic/line input card that supports a 96 kHz sampling rate. It features a new revolutionary analog mic preamp combined with Silk processing from Rupert Neve Designs, which allows you to freely control depth and perspective through modeling in the digital domain. Each input connector can supply phantom power (+48V DC). SILK digital processing technology that has been co-developed by Rupert Neve Designs and Yamaha. The RY16-DA is a 16-channel analog output card that supports a 96 kHz sampling rate. You can use the switches on the board to set maximum output level to +15dBu, +18dBu, or +24dBu. The factory setting is +24dBu. The RY16-AE is a 16-channel digital I/O card that supports the AES/EBU format. Sampling rate converters (SRC) are provided for each of the 16 input channels and 16 output channels. Sampling rate converter for both inputs and outputs. The HY256-TL is a digital I/O card for HY card slots, and compatible with Yamaha’s TWINLANe audio network protocol. The card supports multi-mode fiber connections for reliable operation. Can send/receive uncompressed digital audio signals of 32-bit 96 kHz quality, with a maximum of 256 inputs/256 outputs. Redundant connections are supported with ring topology. Indicators show communication status useful for troubleshooting. The HY256-TL-SMF is a digital I/O card for HY card slots, and compatible with Yamaha’s TWINLANe audio network protocol. The card supports single-mode fiber connections for reliable operation over long distances. The HY144-D is a digital I/O card for HY card slots, and is compatible with the Dante digital audio network over Gigabit Ethernet connections. 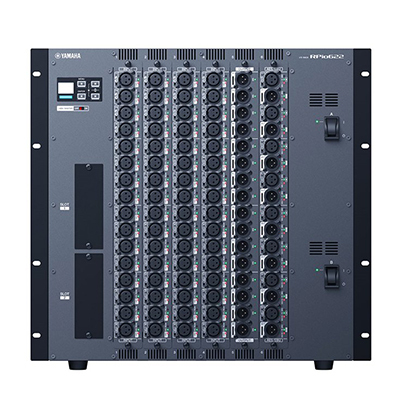 Can send and receive uncompressed digital audio signals of 32-bit 96 kHz quality, with a maximum of 144 inputs/144 outputs. Người đại diện: Mai Thanh Nga.